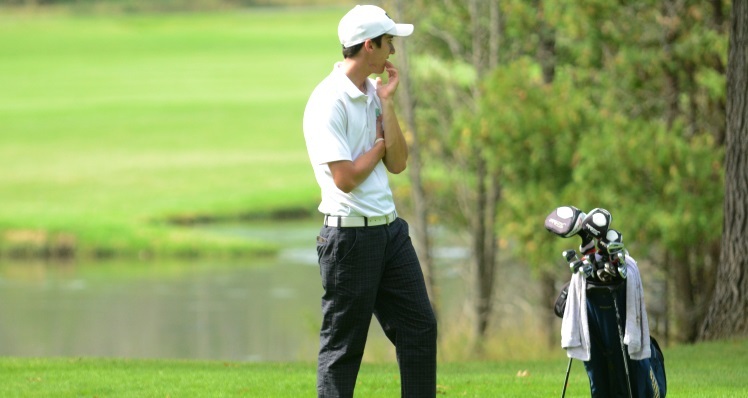 STURGIS, Mich. — The first team score of the season for Marygrove men’s golf resulted in an 11th place finish at WHAC Jamboree Four, an event hosted by Lawrence Tech University in Sturgis, Mich. at Klinger Lake Country Club on Friday (Sept. 18). After producing a team score of 331, the day was highlighted by a pair of records and two sub-80 rounds as the men in Green and Gold continued to improve during the fall campaign. Junior leaders Michael Kanalas (Rives Junction, Mich./Jackson Northwest High School) and Tyler Newell (Livonia, Mich./Divine Child High School) checked in the clubhouse back-to-back once again for head coach Frank McAuliffe and the Mustangs. Newell posted a 78 while Kanalas followed closely with a 79 to mark the first time the longtime Mustangs shot below 80 on the same day. For Newell, the round of 78Â was a collegiate personal best as the junior broke through the 80-barrier. Newell’s 78Â was a product of consistency throughout the round and highlighted by birdies on holes one and 13. The junior also scattered an impressive nine pars to earn the record round. Kanalas’ 79 was three off of his personal best and four of off the lowest round of the year for a Mustang, 75, set by teammate Darryl Holtz at WHAC Jamboree Three. Holtz shot an 87 on Friday, his only other round at the collegiate level aside from the 2015 team-record 75 back on Sept. 9. The Jackson Northwest product enjoyed a stellar afternoon â a round that could have been a personal best if it wasn’t for trouble on a difficult par-four on the back. In all, Kanalas recorded eight pars and three birdies on Friday to finish just shy of his best round of 76 set in 2014. Austin Valentine â a late addition to the team in the spring of 2015 and current men’s soccer starting keeper â tied his teammate Holtz with a round of 87 at the conference’s fourth jamboree. The 87 marked a new personal best for the junior out of Westland, Mich., four shots lower than his record 91 set on Apr. 17 at the WHAC Championships. Valentine’s sub-90 round was made possible by a string of three pars at a crucial point in the round. The Mustangs return to action Sept. 28 and 29 to take part in Arnie’s Intercollegiate Invite at Egypt Valley Country Club in Ada, Mich. The non-conference event is hosted by Taylor University (Ind. ).